Norwegian Air Shuttle ASA operates more than 160 aircraft, mainly Boeing 737s and Boeing 787 Dreamliners. 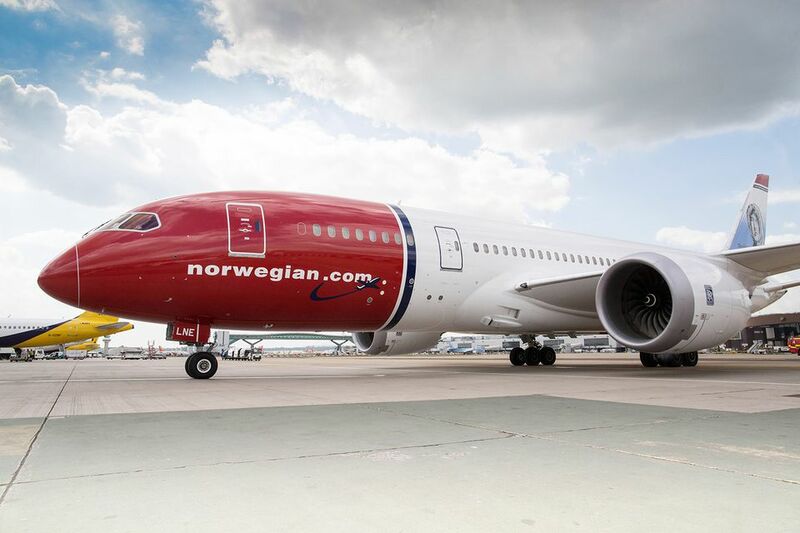 Like other airlines, Norwegian Airlines enforces strict guidelines regarding the carry-on and checked baggage, including size and weight limits. To ensure you aren't surprised when arriving at the airport, double-check you are adhering to the luggage rules for the airline. Norwegian Air allows you to bring one carry-on bag into the cabin free of charge. It is also permitted to bring a small personal item on board, such as a small handbag or a slim laptop case that fits comfortably under the seat in front of you. Flex and PremiumFlex tickets have the same dimension maximums, but the carry-on items can weigh up to 15 kilograms, or about 33 pounds. If you are traveling to and/or from Dubai, hand baggage cannot exceed 8 kilograms. On full flights, Norwegian Air says it may ask passengers to check carry-on items if all overhead compartments are full—even if the carry-on baggage is within the permitted size and weight limits. In those cases, Norwegian Air recommends travelers remove any travel documents, ID papers, medication, and fragile or valuable items from the carry-on bag. Additionally, if you want to bring more bags onboard, you can pay for that option online for an additional fee when booking your ticket. There is no carry-on baggage allowance for infant tickets—infants are those under 2 years of age—but parents can bring a reasonable amount of baby food and milk or formula for the flight. Children 2 to 11 years old can carry on the amount of hand baggage and checked baggage that their ticket type allows. As with carry-on items, your ticket type determines if checked baggage is included, or whether you'll need to pay extra. For LowFare tickets, you are not allowed to check any bags. For domestic flights, if you purchase a LowFare+ ticket, you are allowed to check one bag weighing 20 kilograms, or about 44 pounds. The airline also offers Flex tickets, which allow you to check two bags, each weighing 20 kilograms. For international flights, you are not allowed to check any bags for LowFare tickets. For each LowFare+ ticket, you are allowed one bag weighing up to 20 kilograms. With Flex, Premium and PremiumFlex tickets, you can check two bags each weighing up to 20 kilograms. In addition to the allotted baggage allowances, you can purchase the right to check additional bags. The cost depends on the countries or regions to which you are flying, which Norwegian Air lists as "zones. ", which the airline lists on their website. Each bag must weigh no more than 32 kilograms, or approximately 70.5 pounds, or be lighter than 2 kilograms, or about 4.4 pounds. Your total amount of checked bags cannot weigh more than 64 kilograms or about 141 pounds. Each bag must not exceed 250 by 79 by 112 centimeters—98 by 31 by 44 inches—with a maximum circumference of 300 centimeters, or about 118 inches.